Marilyn SanClemente June 27, 2018 June 27, 2018 Blendabilities Markers, Stampin' Up! Today I am sharing a handmade Shower Invitation that my friend and I designed for her daughter’s shower. I used the new Serene Garden Stamp set from the new Stampin’ Up! catalog. I love the look of this set. It is definitely very serene. This set would be perfect for thank you cards, thinking of you and sympathy cards. So pretty. This set comes in a bundle with matching framelit dies. But it also has a die that embosses the main floral image. The invitations are 5 x 7. The base is a piece of the new Blueberry Bushel cardstock cut to 5 x 7″. I was playing around with the width of the mat for this card and also the portrait versus landscape layouts. The card on the right with the portrait layout has a piece of Whisper White cardstock is cut to 4 3/4″ x 6 3/4″. The image is stamped on the lower left corner with Basic Gray ink. For the landscape invitation I cut the Whisper White cardstock to 4 1/2″ x 6 1/2″ for a wider mat on the base. I used the Old Olive Blends marker to color the leaves on these cards. I really like the shading effects that you can get with the Stampin’ Blends markers. For the flowers I used the Blueberry Bushel ink with an aqua painter since this color isn’t available in the Stampin’ Blends markers yet. So of course I had to try out the new embossing die. So I made a card using some of the new purple colors; Highland Heather and Gorgeous Grape. NOTE: you do need an embossing mat for your Big Shot. Check out the Embossing mats in the new catalog on page 221. For the this card, the base is Gorgeous Grape cardstock cut to 8 1/2″ x 5 1/2″ scored at 4 1/4. The next layer is 4″ x 5 1/4″ piece of Highland Heather cardstock. The next layer is a 2″ x 3 1/2″ piece of Whisper White cardstock with a mat of Gorgeous Grape cut to 2 1/8″ x 3 5/8″. For this card, I used an aqua painter and did a wash across the white cardstock for the sky. I stamped the corner leaf image in the two bottom corners. Next I stamped the leaf with single flower image and the larger flower above. 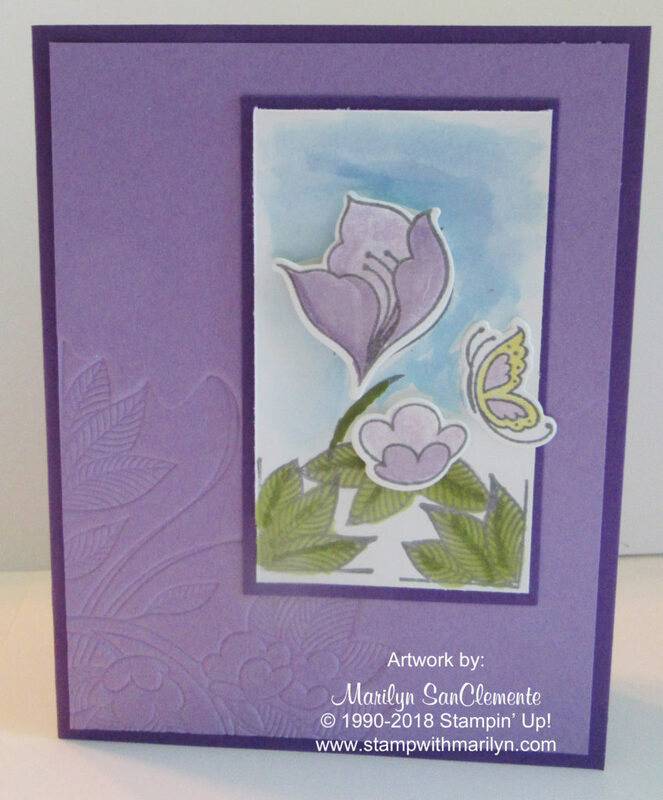 I then stamped the two flowers again with the butterfly on scrap cardstock and cut them out with the framelit dies. I colored these image with Highland Heather ink and an aqua painter. The leaves are colored with the Old Olive Blends Markers. Then I attached the flower over the image with mini dimensionals. You can’t tell by the pictures, but I also used a Wink of Stella pen on the larger flower so that it stands out and shimmers which it does! 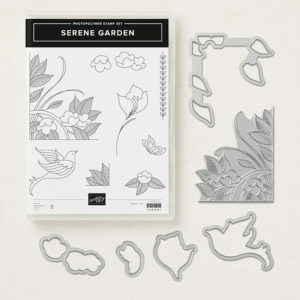 I can tell that the Serene Garden stamp set is going to become one of my go to stamp sets with this catalog! 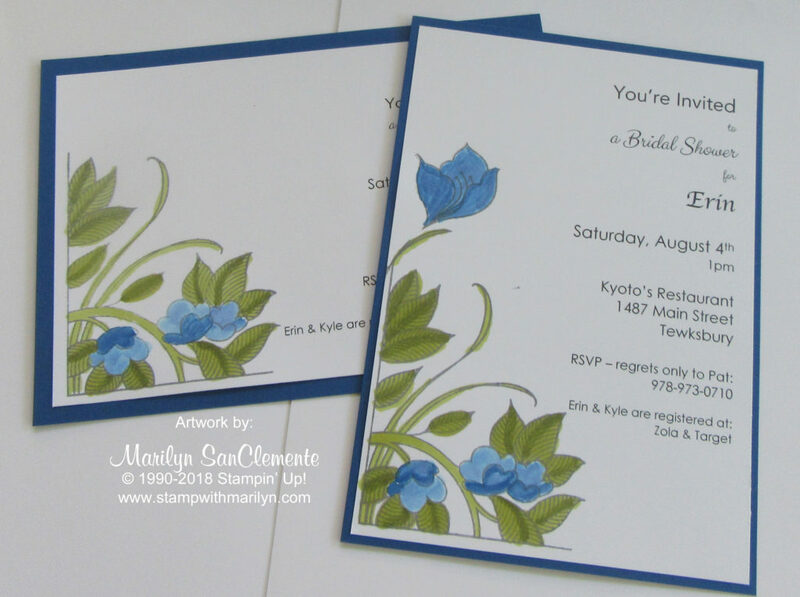 Handmade Shower Invitation, Serene Garden. Bookmark.